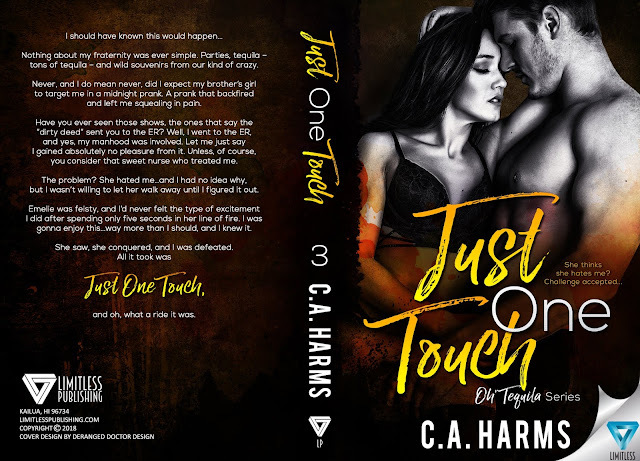 JUST ONE TOUCH by CA Harms is available for pre-order! Have you ever seen those shows, the ones that say the “dirty deed” sent you to the ER? Well, I went to the ER and yes, my manhood was involved. Let me just say, I gained absolutely no pleasure from it. Unless, of course, you consider that sweet nurse who treated me. The problem? She hated me...and I had no idea why, but I wasn’t willing to let her walk away until I figured it out. Emelie was feisty and I’d never felt the type of excitement I did after spending only five seconds in her line of fire. I was gonna enjoy this...way more than I should, and I knew it. All it took was just one touch and oh, what a ride it was.